"I have over 30 years experience in caring for adult patients with lung disease. My major clinical interests are asthma, smoking related lung disease and chest infections. As a keen rugby fan I love to watch Ireland play at Lansdowne Road. " 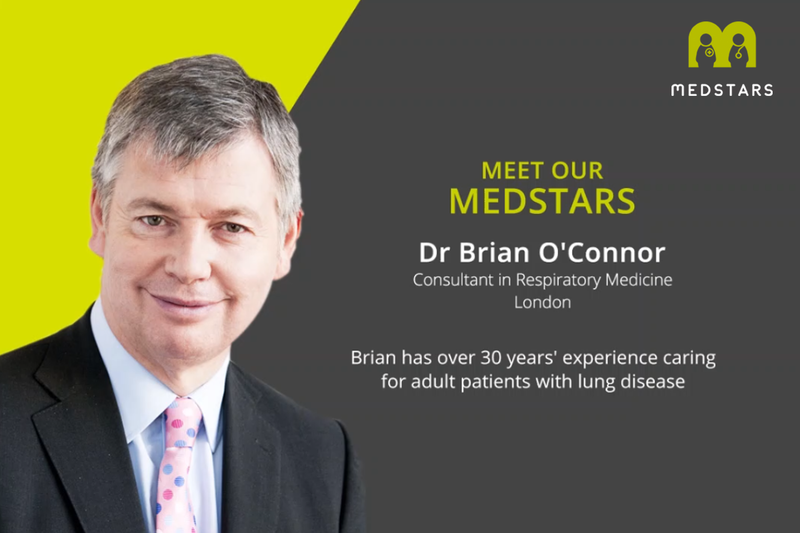 Brian has been on the specialist register for respiratory medicine since 1996 and has over 20 years working in the NHS and academia before becoming a full time private London physician in 2008. He is highly regarded and an expert in his field. Dr O'Connor is a founder of Queen Anne Street Medical Centre where he also consults. He is also a scientific adviser at Respiratory Clinical Trails (RCT). RCT is a specialist clinical trial organisation which provides a complete clinical service from portfolio review and early clinical development strategy, study protocol development to clinical trial completion with a particular emphasis on allergic rhinitis, asthma and COPD. Dr Brian O'Connor graduated from Dublin in 1980, completed his post graduate general medical training there and passed the examination for membership of Royal College of Physicians of Ireland in 1984. He moved to Royal Brompton Hospital in 1988 to complete his specialist respiratory training and completed an MD thesis on research into airway inflammation and asthma. He is a Fellow of the Royal College of Physicians of Ireland and of the Royal College of Physicians of London. In 1992 Dr O'Connor was appointed as Senior Lecturer at the National Heart and Lung Institute and a Consultant in Respiratory Medicine at Royal Brompton Hospital in London. There he established a leading edge clinical research facility, to investigate new treatment strategies in Airways Disease. In 1997 he relocated to Kings College School of Medicine to continue his clinical research and was appointed Consultant Respiratory Physician at Kings College Hospital until March 2008, when he commenced full time private practice. In private practice since 1996, Dr O'Connor remains fully active in clinical research on Airways Diseases. He has published and presented more than 200 papers in high impact Peer Review Journals and at international scientific meetings. Dr O'Connor has edited books, and written chapters on Asthma and Chronic Obstructive Pulmonary Disease (COPD). He has sat on prestigious Advisory Boards for learned societies, various healthcare institutions and has served as vice-chair of King's College Hospital Local Research Ethics Committee, as well as Chair for Medical Advisory Meetings (MAC) at Queen Anne Street Medical Centre until December 2009.